Ralph Ellison famously proclaimed that “geography is fate.” These films portray how gentrification in Washington, DC, Jim Crow segregation in Houston, the pursuit of personal and political empowerment in L..A., and the abject space of prison shape the fates of Black people in individual and collective ways. 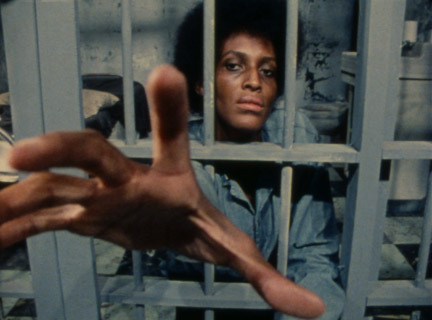 Inspired by a dream director Haile Gerima had after seeing Angela Davis handcuffed on television, Child of Resistance challenges linear norms of time and space as it explores the dreams and abstractly rendered fantasies of a militant who has been imprisoned as a result of her fight for social justice. Based on a memoir by Carroll Parrott Blue, and using her great-grandmother’s quilt as an interface, this excerpt from an evocative DVD-ROM leads viewers on a rich visual and textual exploration of the history of Houston's Black community through a series of visual "panscapes" constructed from original photographs, video and archival materials, and the spoken word. A female typist goes from apathetic to empowered through the help of a man giving out political flyers on the street, as director Melvonna Ballenger muses on the soundtrack about the restorative and revivifying potential of rainy days. Presented in association with UCLA Film & Television Archive and supported in part by grants from the Getty Foundation and The Andy Warhol Foundation for the Visual Arts. The series is curated by Allyson Nadia Field, Jan-Christopher Horak, Shannon Kelley and Jacqueline Stewart. Complete details on UCLA’s L.A. Rebellion: Creating a New Black Cinema initiative here. University of Chicago Arts Council, Franke Institute for the Humanities, Tom Gunning/Mellon Fund, UC Center for the Study of Race, Politics and Culture, Logan Center for the Arts, Conversations at the Edge, Block Cinema, Black Cinema House.